Army of One - BUY THIS DVD! 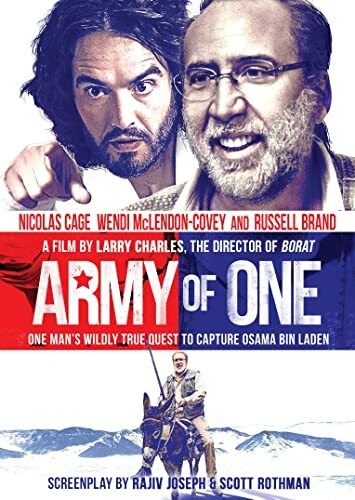 Directed by Larry Charles (Borat, Brüno) ARMY OF ONE is the mostly true story of Gary Faulkner (Nicolas Cage), an ex-con, unemployed handyman, and modern day Don Quixote who receives a vision from God (Russell Brand) telling him to capture Osama Bin Laden. Armed with only a single sword purchased from a home-shopping network, Gary travels to Pakistan to complete his mission. While on his quest, Gary encounters old friends back home in Colorado, the new friends he makes in Pakistan, the enemies he makes at the CIA - and even God and Osama themselves. Rainn Wilson, Paul Scheer and Wendy McLendon-Covey also star in this hilarious tale of patriotism and one man s quest for justice. THEN SEND IN A COMMENT ABOUT YOUR FAVORITE FUNIMATION TITLE (you may click on artwork above for a refresher) PLUS YOUR NAME AND ADDRESS TO contests@efilmcritic.com or WeLoveHBS@aol.com. (Just one e-mail please.) Put [b]"DID HE GET BIN LADEN?" in the subject line and cross your fingers. We will draw names and one of the prizes could be yours. Only 1 entry per household.